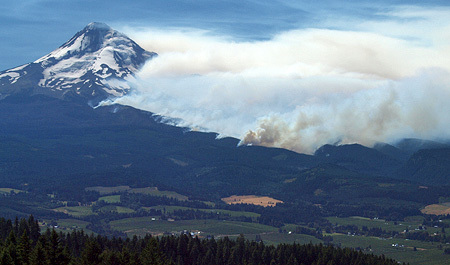 On August 26, 2011, a lightning strike ignited what was to become the Dollar Lake Fire, on Mount Hood’s rugged north side. The fire started in the Coe Branch canyon, just below the Elk Cove trail, and was spotted by numerous hikers. Initially, it seemed small and manageable. But over the next few days and weeks, arid conditions and strong winds spread the fire from Stranahan Ridge on the east to Cathedral Ridge on the northwest side of the mountain, eventually consuming some 6,300 acres of high elevation forest. The blaze burned through September and into early October, when fall rains finally arrived. 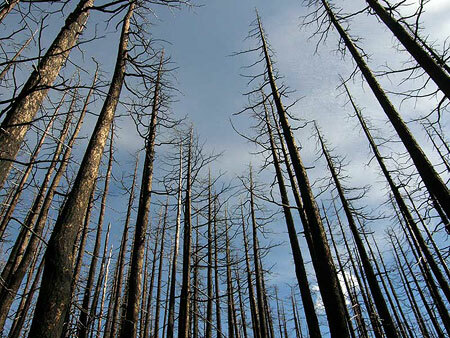 Some of the burn was of the beneficial form, a mosaic fire leaving islands of surviving trees, but much of the fire was too hot and the accumulated forest fuel too plentiful to prevent devastating crown fires from sweeping across the forest. Eventually, the fire destroyed most of the standing timber and burned the forest duff down to mineral soil throughout most of the burn area. 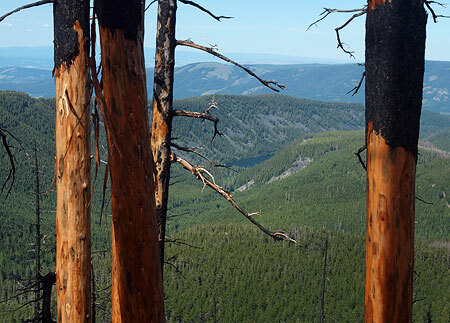 The fire was contained entirely within the Mount Hood Wilderness, thanks to the recent Clear Branch additions that expanded the wilderness boundary on the north to encompass the Clear Branch valley and the high country surrounding Owl Point, to the north. 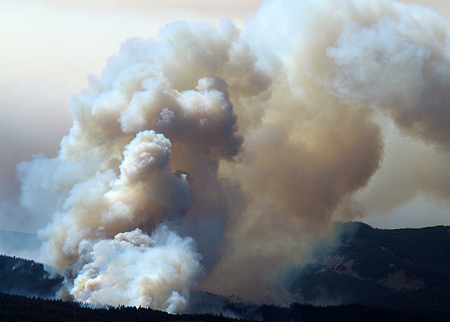 While this complicated fire fighting, it has also created a living laboratory for forest recovery, as the USFS is unlikely to assist the reforestation process inside the wilderness boundary. The Forest Service map, below, shows the broad extent of the fire. Though the fire burned to the tree line in several spots, a surprising amount of terrain along the iconic Timberline Trail was somehow spared. 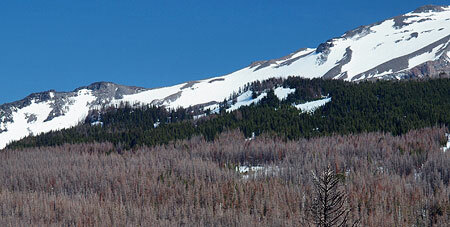 While the burn touched Elk Cove and Cairn Basin, WyEast Basin and Barrett Spur are well beyond the burned area. The Clear Branch wilderness additions to the north were mostly spared, as well. The following is a photo essay from my first visit to the burn, on June 22, 2012, and is the first in what will eventually be a series of articles on the aftermath of the fire. The devastation left by the fire is awesome to witness, but also starkly beautiful when you consider the context of a forest fire. After all, this event is part of the natural rhythm of the forest just as much as the changing of seasons. From this point forward, we will have a front-row seat to the miracle of life returning to the fire zone, much as we’ve watched life return to the Mount St. Helens blast zone over the past 32 years. And as my photos show, the rebirth of the forest ecosystem has already begun on Mount Hood’s northern slopes. Untouched trailhead at Vista Ridge. From the Vista Ridge trailhead, I followed the Vista Ridge Trail to the snow line, above about 5,000 feet. The Vista Ridge trailhead is completely untouched, though the fire swept through a vast area immediately to the south. 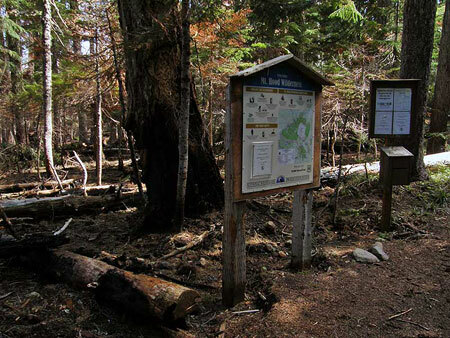 Yet, no sign of the fire is evident at the trailhead marker (above). A bit further up the trail, at the Old Vista Ridge trailhead, the fire zone comes into view. Where green forests existed last summer, browned foliage and a burned forest floor spread out east of the junction. This fringe of the fire is of the healthy “mosaic” form, sparing large trees, while clearing accumulated forest debris. Old Vista Ridge trailhead spared by fire… just barely. An unexpected benefit of the fire came last fall, when the USFS added the long-neglected Old Vista Ridge trail to official agency fire maps (below) released to the public. Volunteers began restoring this beautiful trail in 2007, but formal acknowledgement of the route on USFS maps is a welcome development. 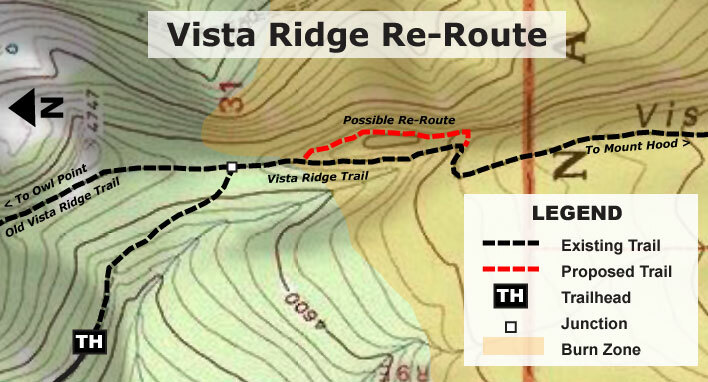 Clearly, the restoration of the Old Vista Ridge trail helped fire fighters reach this area, and could have served as a fire line had the blaze swept north, across the Clear Branch. Hopefully this is an indication that the Old Vista Ridge trail will someday reappear on the USFS maintenance schedule, too. Turning south on the Vista Ridge trail from the Old Vista Ridge junction, the wilderness registration box and map board seem to have received divine intervention from the fire — the blaze burned within a few feet of the signs, yet spared both. 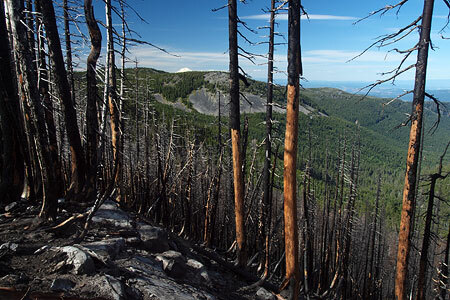 From here, the Vista Ridge trail abruptly leaves the scorched fringe of the fire, and heads into the most devastated areas. 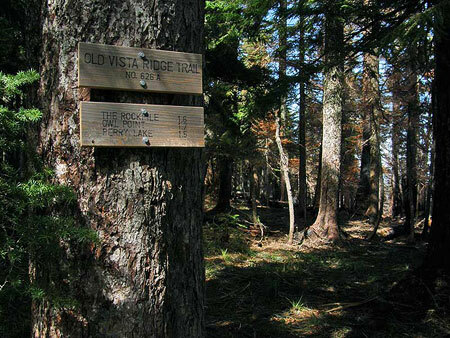 Vista Ridge trail signs were spared… by divine guidance? A few yards up the Vista Ridge trail, the devastation quickly intensifies. From about the 4,700 foot level, the Dollar Lake Fire burned the forests along Vista Ridge to bare earth. In this area, the entire forest crowned, leaving only a scattering of surviving trees where protected by topography or sheer luck. Forest understory, woody debris and duff burned to mineral soil, leaving a slick, muddy surface of ash. 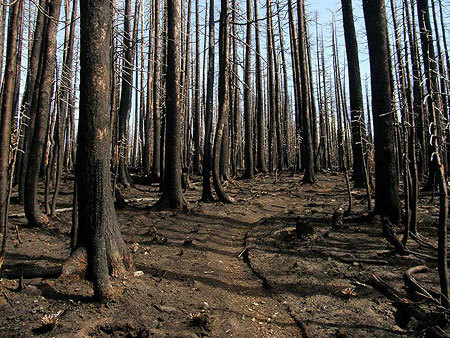 For those who have hiked through the previous Bluegrass Fire or Gnarl Fire zones on the east slopes of Mount Hood, this eerie scene is familiar. The surprisingly intact trail curves through the devastated forests along Vista Ridge. Crown fires have killed almost all of the standing forests along Vista Ridge. Amid the devastation in this hottest part of the Dollar Lake Fire, signs of life are already emerging. 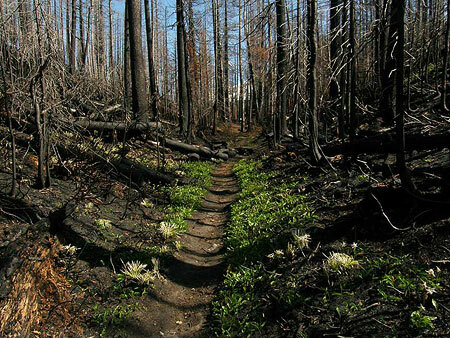 At this elevation, one of the toughest survivors is beargrass, a member of the lily family with a deep rhizome that allows plants to survive even the hottest fires. These plants are normally evergreen, but were completely scorched in the fire. The new grown in this photo (below) has emerged this spring. Beargrass (Xerophyllum tenax) emerges from underground rhizomes protected from the fire. Another surprise is avalanche lily, one of the more delicate flowers in the subalpine ecosystem. 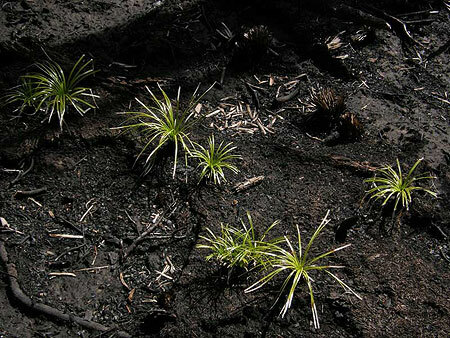 Like beargrass, these plants survive thanks to a bulb located deep enough in the soil to escape the heat of the fire. As one of the early bloomers in the mountain forests, these plants area already forming bright green carpets in the sea of fire devastation (below). 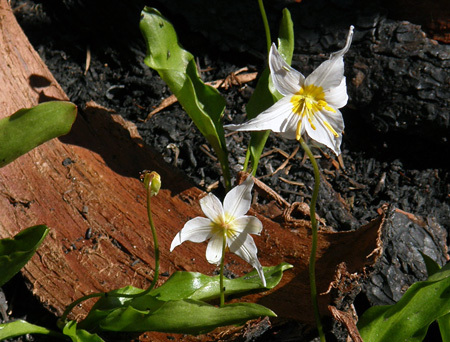 Avalanche Lily (Erythronium grandiflorum) emerging from the ashes. A ribbon of green, these Avalanche Lilies are emerging along the Vista Ridge trail. Another of the beneficial aspects of the fire comes into view a bit further up the trail: several sections of Vista Ridge had long been overgrown with thickets of overcrowded, stressed trees that were ripe for a burn. Over the coming years, these areas are likely to evolve into beargrass and huckleberry meadows like those found at nearby Owl Point or along Zigzag Mountain, where fires have opened the landscape to sun-loving, early succession plants. 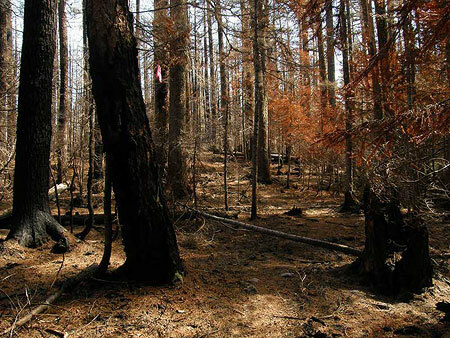 Unhealthy forest thickets cleared by fire — a beneficial outcome of the blaze. 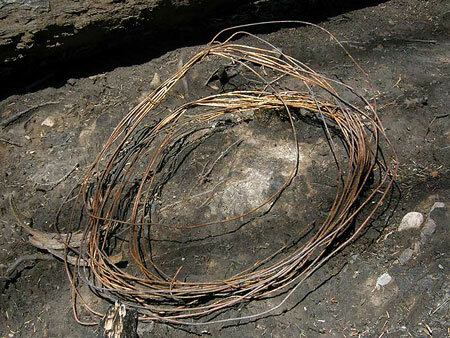 One human artifact was uncovered by firefighters — a coil of what must be telephone cable (below). This is a first along the Vista Ridge trail, but makes sense given the insulators and cable found along the Old Vista Ridge trail. It’s hard to know what this connected to, but on the north end, it served the old Perry Lake Guard Station and lookout, just east of Owl Point. It’s possible this line extended to the Bald Mountain lookout, though I have been unable to verify this on historic forest maps. Telephone cable on Vista Ridge – gathered up and coiled by firefighters? 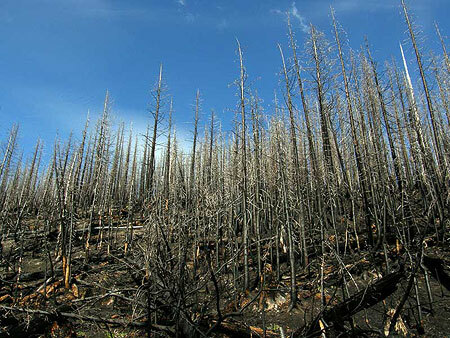 Though much of the devastation zone still consists of blackened trees and soil, some of the burned forest has begun to evolve into the uniquely attractive second phase. 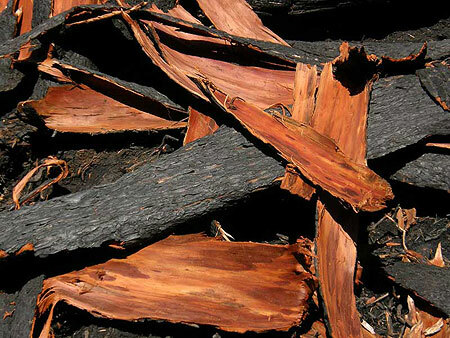 This happens when scorched bark peels away from trees to reveal the often beautiful, unburned wood beneath. Soon, all of the trees in this forest will shed their bark. The skeletons of thousands of trees will emerge in colors of red, yellow and tan, then gradually fade to a bleached gray and white with time. The burned trees of Vista Ridge are just beginning to shed their blackened bark, revealing beautiful trunks unscarred by the fire. This second phase of the fire is helped along by winter snow. As the scene above shows, the freeze-thaw and compacting effects of the snow pack have already stripped many trees of their bark beneath the now-melted snowpack. 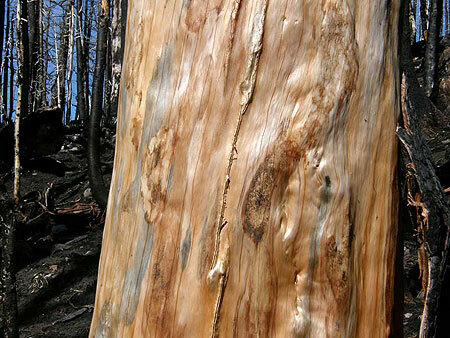 Hot summer sun will continue this process, shrinking the remaining bark until it drops from the drying tree trunk. This process of de-barking is the first in a post-fire sequence of events that will recycle much-needed organic matter to the forest floor. Twigs and tree limbs will soon fall, and over time, whole trees will begin to drop. This is a critical phase in stabilizing the forest soil, when low vegetation is still just beginning to re-establish in the fire zone. Strips of tree bark are the first organic layer to accumulate on the floor of the burn zone. The next few images show the extent of the Dollar Lake Fire, as viewed from Vista Ridge. To the east (below), The Pinnacle was mostly burned, but the fire somehow missed stand of trees just below the north summit. These trees will play an important role in reforestation of the area, partly because so few trees survived the fire, but also because of their geographic location above the surrounding forest, where wind will widely scatter their seeds. The Pinnacle, where a small grove of of trees on the north slope survived the fire. 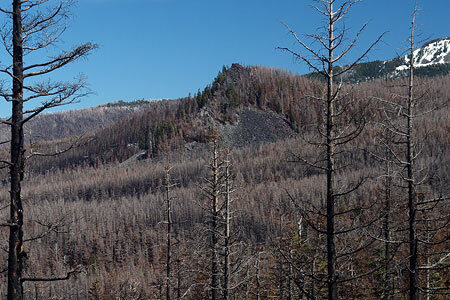 To the south, the area above Elk Cove known as 99 Ridge (shown below) was partly spared, though the fire did scorch the east slopes of the ridge. From this side (to the west), the Timberline Trail corridor was almost completely spared. Ironically, Dollar Lake — the namesake for the fire — appears to have been spared, as well. To the west of 99 Ridge, WyEast Basin was also spared, but the area along the Timberline Trail to the west of the basin, along the upper sections of Vista Ridge, was largely burned. 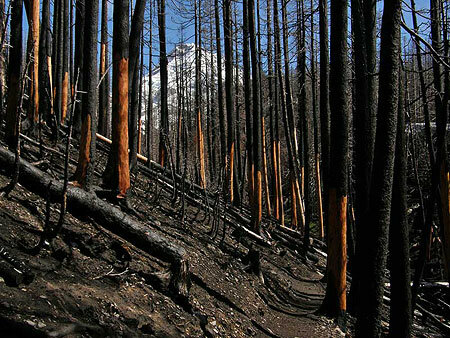 Forests along 99 Ridge were spared by the fire. This panoramic view (below) encompasses the entire mid-section of the fire, from Stranahan Ridge on the horizon to Vista Ridge, on the right. This is a new viewpoint along a largely unnoticed rocky scarp on the east shoulder of Vista Ridge, now revealed thanks to the fire. The new views from Vista Ridge include Laurance Lake and Bald Butte, to the east. By following the true ridge top of Vista Ridge, the new views extend east across Laurance Lake and the Clear Branch valley to Bald Butte and the Columbia Basin (above). Most of the area below the ridge is not burned, and this new perspective on the recent additions to the Mount Hood Wilderness is both unexpected and beautiful. 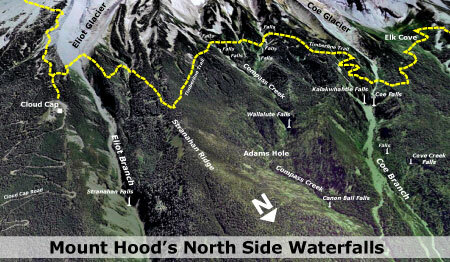 To the north, the new views include the rugged and little-known Owl Point area of the expanded Mount Hood Wilderness (reached by the Old Vista Ridge trail). Mount Adams rises in the distance, above the talus fields and meadows of Owl Point. Owl Point and Mount Adams from newly revealed viewpoint on Vista Ridge. This suddenly very scenic “true” ridge along the lower portion of Vista Ridge is easy enough to hike by simply following the ridge top where the existing trail heads into a narrow draw, about one-half mile from the Old Vista Ridge trail junction. It’s worth the visit if you’d like to inspect the scenery and Dollar Lake Fire up-close. But in the spirit of recasting the Vista Ridge trail in the aftermath of the fire, and taking in these new views, now would be the perfect time to simply realign the trail along the ridge top. As shown on the map (below), this project could be done in a weekend by volunteers, if approved by the Forest Service. The fire has already done the heavy work of trail building by clearing the ground to mineral soil: designing and completing a realigned trail here would be quite straightforward. The slope of the ridge top, itself, is surprisingly gentle and would allow for an easy grade, similar to the current trail. I hope to pitch this idea to the Forest Service, so if you’re interested in getting involved, watch the Portland Hikers forum for updates. That’s where volunteer work parties will be organized if there is interest from the USFS. Until then, take the time to explore the fire zone, and watch the unfolding forest recovery firsthand. 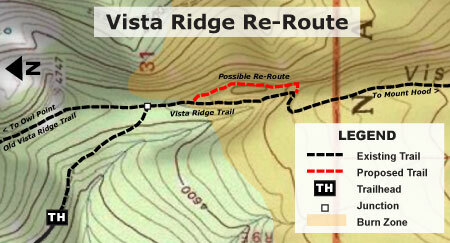 Visit the Portland Hikers Field Guide for directions to the Vista Ridge Trailhead. 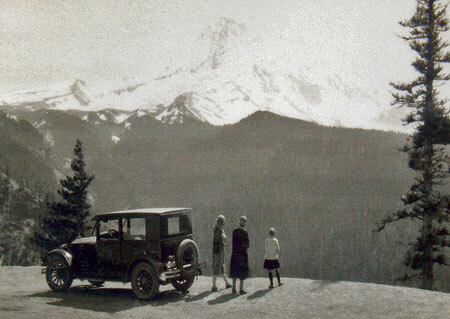 Fans of the classic 1975 edition of Jack Grauer’s “Mount Hood: A Complete History” have memorized the many rare photos and stories found only in this unique book. For waterfall hunters, the photo on page 226 (shown above) is particularly compelling. 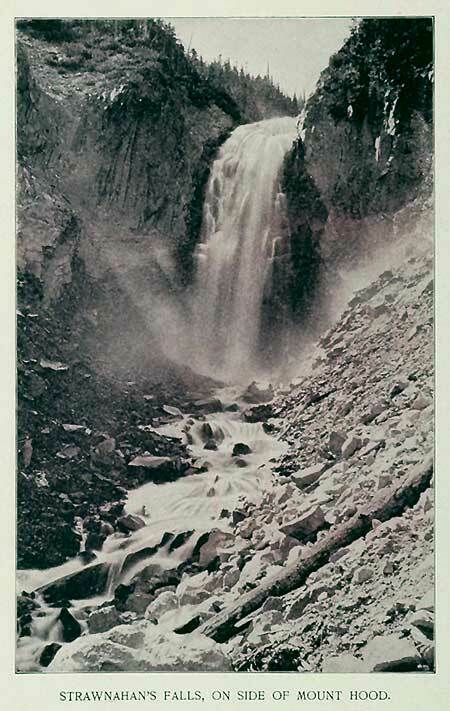 The 1890s image is titled “Wallalute Falls on Compass Creek”, and shows the tiny figure of a man at the base of a dramatic falls. The mystery in this caption stems from the fact that USGS maps have long shown Wallalute Falls to be the prominent cascade on the Eliot Branch, just below Cloud Cap. 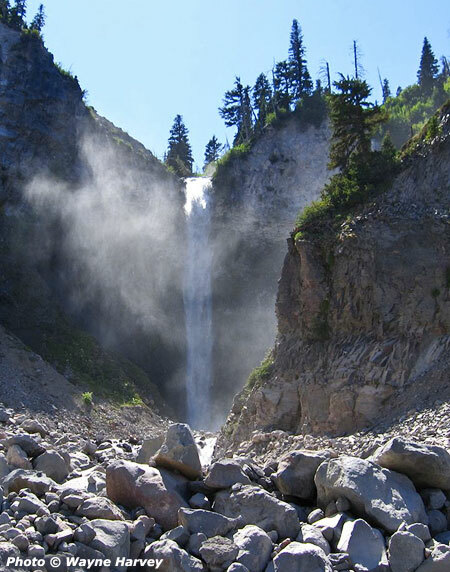 This huge falls is visible from Inspiration Point on the Cloud Cap Road, and is clearly not the same as the cascade shown in the Grauer book. This article attempts to untangle the story of these waterfalls, and the confusion surrounding the names of the remarkable, mysterious group of waterfalls spread across the Eliot, Compass and Coe drainages. 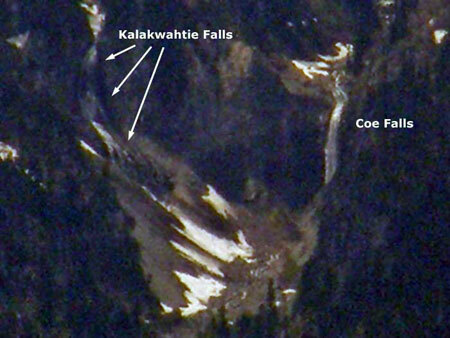 My excitement over this sighting began with the first good look at the very tall, powerful Coe Falls. Though I had explored the brink of the falls from the Timberline Trail, I had never made the rugged descent to the base of the falls. Thus, finally seeing this magnificent waterfall in its entirety was a thrill. Wayne’s photos of Coe Falls immediately raised questions about the Wallalute Falls image in the Grauer book. The resemblance was striking, and without definitive modern images of the waterfalls on Compass Creek to compare to, another possibility arose: was the falls in Jack Grauer’s book actually Coe Falls? 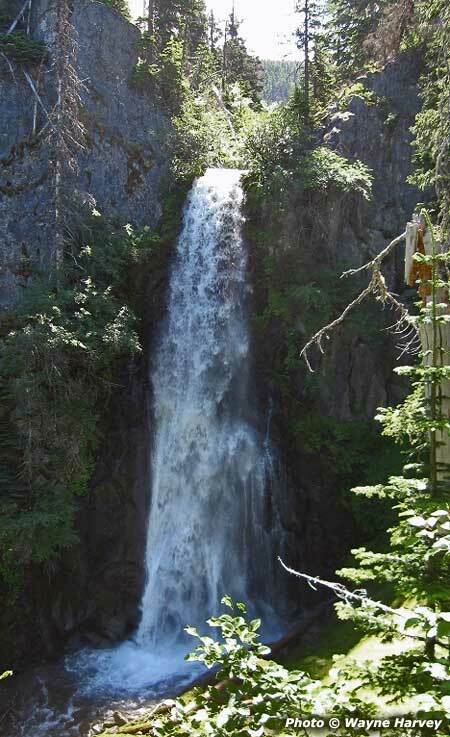 Further intrigued by the unfolding mystery, Wayne made a second, even more rugged solo trip into the Coe Branch canyon in July 2011, this time to explore Compass Creek and document the remaining waterfalls of Mount Hood’s north slope. Wayne’s 2011 return trip took him across the boulder-filled floor of the Coe Branch valley, then into the dense underbrush of the remote Compass Creek canyon. His first discovery was the lower of the two mapped falls on Compass Creek to be much larger than anyone had imagined, dropping roughly 100 feet into a picturesque bowl (below). The larger-than-expected lower falls also presented an obstacle for Wayne as he searched for a route upstream to the main falls. He later described a scramble up a steep chute that was “all fours in places”, and the only passable route. Beyond the scramble past the lower falls, Wayne continued upstream to an impressive view of Compass Creek Falls, dropping nearly 200 feet into a sheer amphitheater (below). 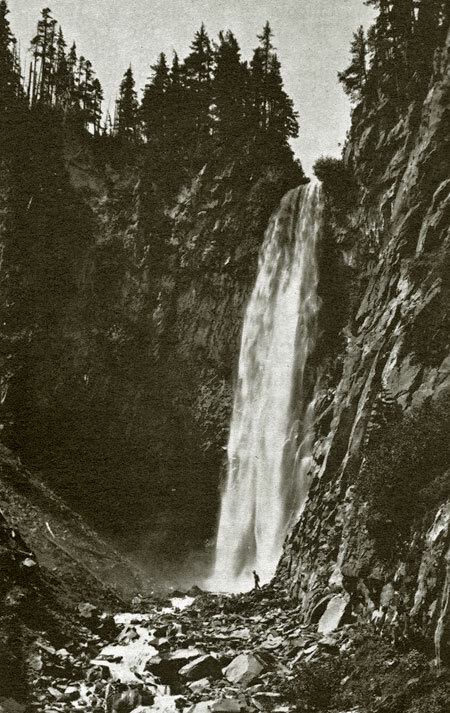 With this image, Wayne had solved the Wallalute Falls mystery: the falls pictured in the Grauer book is clearly the same as the falls he documented on Compass Creek. Wallalute Falls is indeed on Compass Creek, not the Eliot Branch. 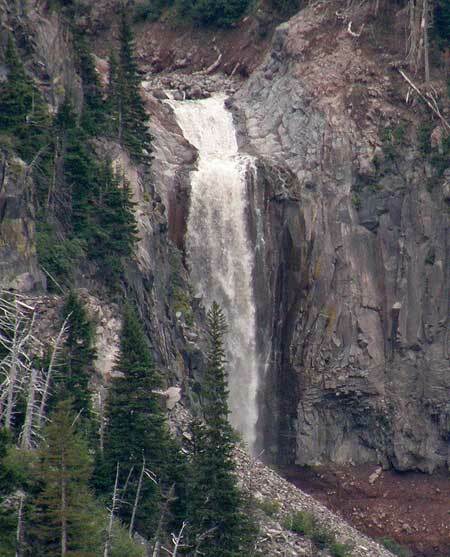 For years, waterfall hunters have recognized this falls to be the large, prominent falls on the Eliot Branch identified on maps as Wallalute Falls (shown below in its modern form). The reference to “Strawnahan” (which is clearly a misspelling of “Stranahan”, the name given to a nearby ridge in honor of area pioneers) was assumed to be either an informal name that was later replaced by “Wallalute” or simply an error on the historic photo, itself. 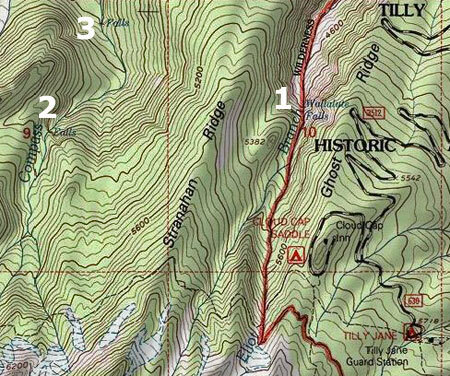 Wayne Harvey’s field documentation of the real Wallalute Falls now seems to provide definitive evidence that a map error occurred, transferring the “Wallalute” name from Compass Creek to the Eliot Branch, with the “Stranahan” name simply getting lost in the shuffle. The following map provides the context for the USGS map error by showing the close, and potentially confusing proximity of (1) Stranahan Falls (labeled as Wallalute on USGS maps), (2) the true Wallalute Falls on Compass Creek, and (3) the lower falls on Compass Creek. These accounts are the gold standard for Mount Hood history, partly because Grauer lived a good portion of it himself, but also because of the extensive spoken history he has documented through interviews of the historic figures, themselves. 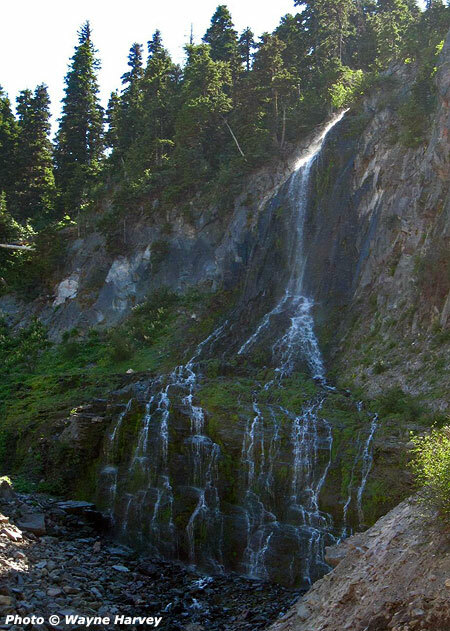 Grauer’s description gives a name to the lower Compass Creek falls for the first time in recent memory — “Canon Ball Falls” — as well as the canyon section that encompasses both Wallalute and Canon Ball falls on Compass Creek — “Adams’ Hole”. Grauer is also definitive on the Stranahan and Wallalute names, correctly tying them to the Eliot Branch and Compass Creek, respectively. The USGS map error that created the confusion may go back more than a century, as it appears to be reflected on all USGS maps known to carry the name “Wallalute”. The follow map excerpt (below) is from 1924, and shows how the error could have occurred: note that early topographic maps didn’t always show the crosshatch used to denote waterfalls on more contemporary maps. With this omission, and the close proximity of Compass Creek and the Eliot Branch on earlier, small-scale maps, it’s easy to see how later cartographers might have been confused as to which stream Wallalute Falls was really on. The following USGS map excerpt (below) was published in 1962, and is the first to attach Wallalute Falls specifically to the Eliot Branch. 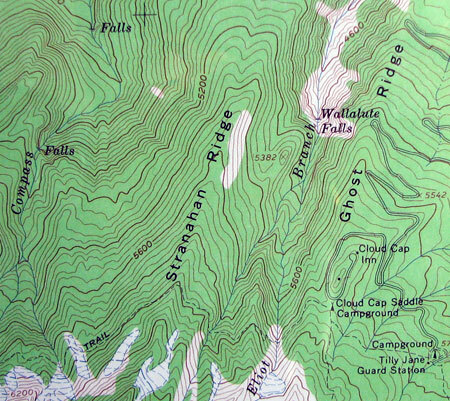 This map appeared when the 1:24,000 topographic series was being published, and the larger scale allowed features like Wallalute Falls to be more definitively identified — or, in this case — misidentified. 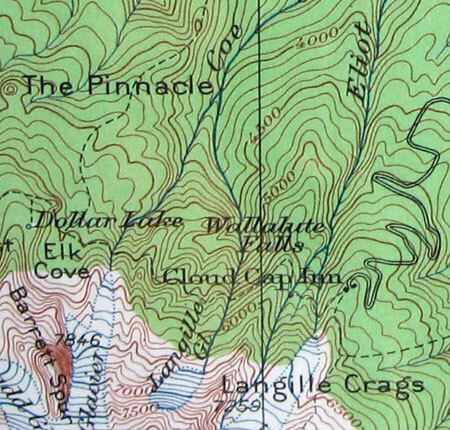 Though the location of Wallalute was in error on the 1962 sheets, these large-scale maps did show the the waterfalls on Compass Creek and the Coe Branch accurately for the first time. Pulling all of this together, the following is an oblique view of the north side region showing all of the waterfalls in context: Stranahan Falls on the Eliot Branch, Wallalute and Canon Ball falls on Compass Creek, and Kalakwhahtie and Coe falls on the Coe Branch. Also shown are a couple of unnamed tributary waterfalls in the Coe Branch canyon, and there are surely other waterfalls yet to be discovered in this seldom-visited area. In an effort to close the chapter on this naming saga, I plan to provide the documentation from this article to the Oregon Board of Geographic Names (OBGN), in hopes that they can eventually look into the matter and perhaps correct the map error of more than a century ago. The series of waterfalls described in this article are remote and difficult to reach. Visiting these waterfalls is only for expert explorers. 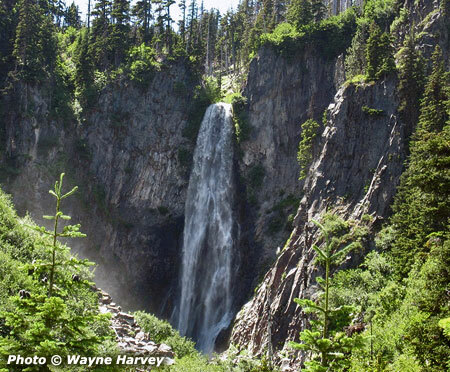 Wayne Harvey approached the Coe and Compass Creek falls from the Elk Cove Trail, dropping into the canyon just beyond the prominent Coe Canyon overlook. This required a rugged descent of nearly a thousand vertical feet, followed by challenging bushwhacks at stream level to the waterfalls. Stranahan Falls can be seen from Inspiration Point, but represents a potentially dangerous descent into a canyon that has been destabilized by recent floods. However, there are good views of the falls from a boot path that descends to a rocky overlook, just below Inspiration Point on the Cloud Cap Road. 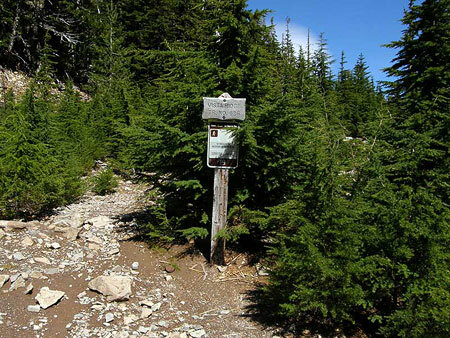 One of the trail concepts in the Mount Hood National Park Campaign calls for a “low trail” paralleling the Timberline Trail. 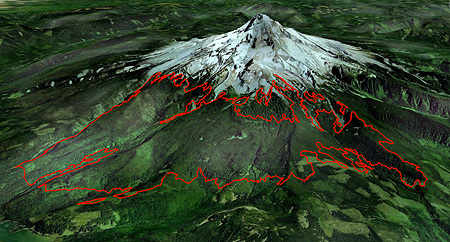 On the north side of Mount Hood, this new route would connect the dots among the string of waterfalls described in this article. Wayne Harvey’s remarkable images of the waterfalls only underscore the case for providing access to these beautiful places, hiding in plain sight. Acknowledgements: special thanks to Wayne Harvey for the use of his images and field reports, and to both Wayne Harvey and Bryan Swan of the Northwest Waterfall Survey for their help in untangling the history of geographic names in the Eliot, Compass and Coe drainages.